« Mozzarella di Bufala Campana AOP» (hereafter: « Mozzarella di Bufala Campana DOP AOP ») is a designation of protected origin of Mozzarella di Bufala Campana DOP. It is part of those fresh cheeses with a pasta filata exclusively produced with buffalo milk coming from the original area and made following a technological process matching a strict requirements specification. 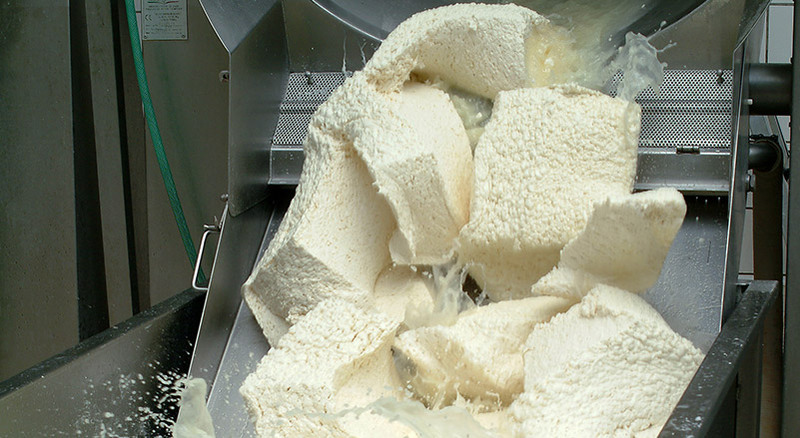 Organoleptic and commercial characteristics of the typical cheese of Mozzarella di Bufala Campana DOP are officially considered since their registration in the DOP Community Register in 1996. 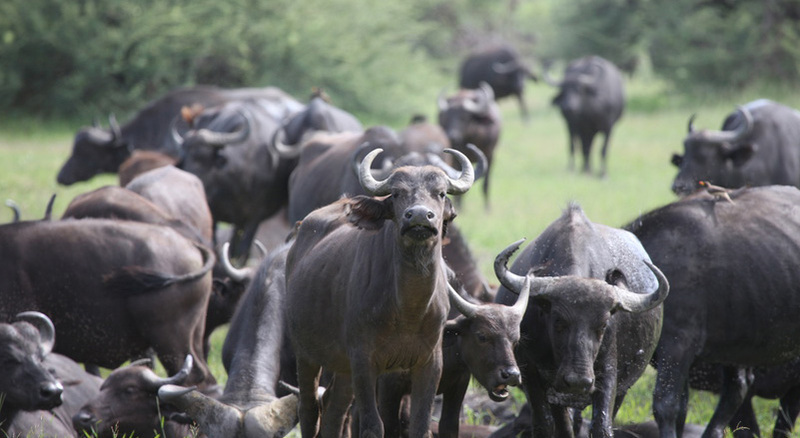 Buffalo milk has a different composition compared to milk from other animals used for cheese production. For instance, compared to cow or sheep cheese, it contains more proteins, fats and above all more calcium. Another specificity is the absence of carotenoids in its composition. This characteristic can be observed in the final product under this typical and unique white of the Mozzarella di Bufala Campana DOP. Milk produced in farms is very quickly transported in production sites, where it will pass all sanitary and hygiene controls, and then controls related to requirements specification, before launching production itself. 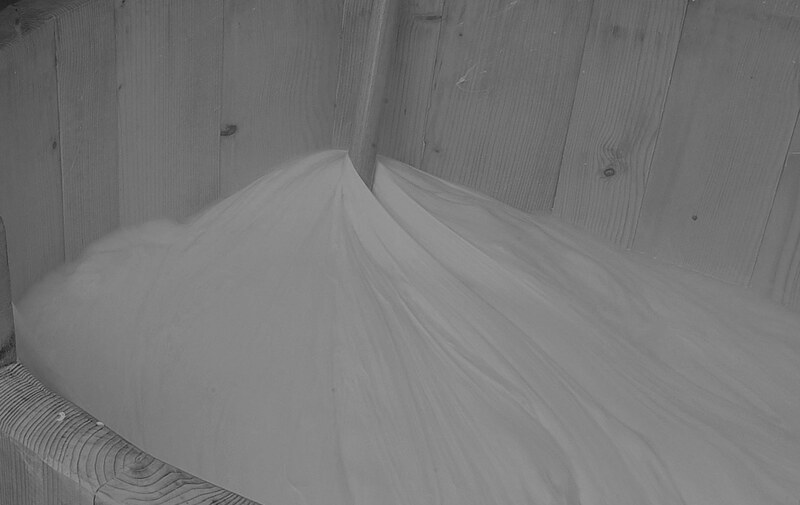 Coagulation comes after adding milk, previously heated between 33 and 39°C, of a natural serum (called « cizza ») coming from the elaboration of the previous day. Adding that activates the milk and makes it ready for coagulation. Coagulation processes right afterwards in pots or steel tanks, exclusively using calf rennet. In a few minutes, milk curds and then we break compact masses with a tool names « spino », which shrinks them to the size of a big nut. At this moment, solid and liquid phases of the milk separate (syneresis of the milk). The liquid phase, also called “whey” is withdrawn. From that raw material, we can obtain the excellent Ricotta di Bufflonne from Campanie. 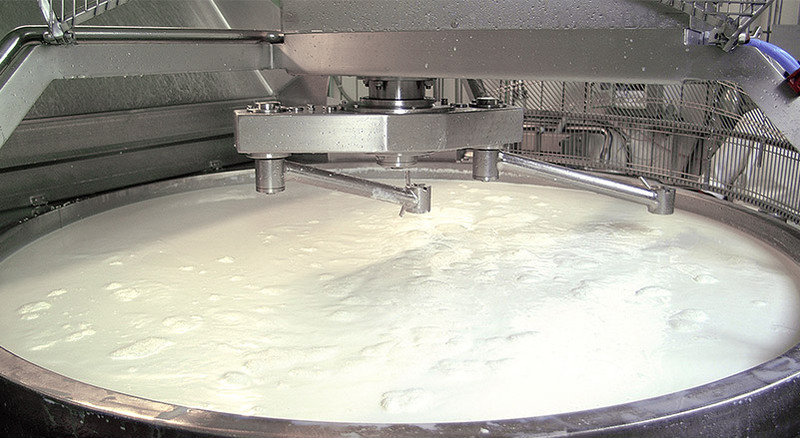 The solid phase, called milk curd, will get more acid with the serum, until it is considered as “mature” or “ready” for spinning. This step consists in adding boiled water to more or less 500g of reduced curd. 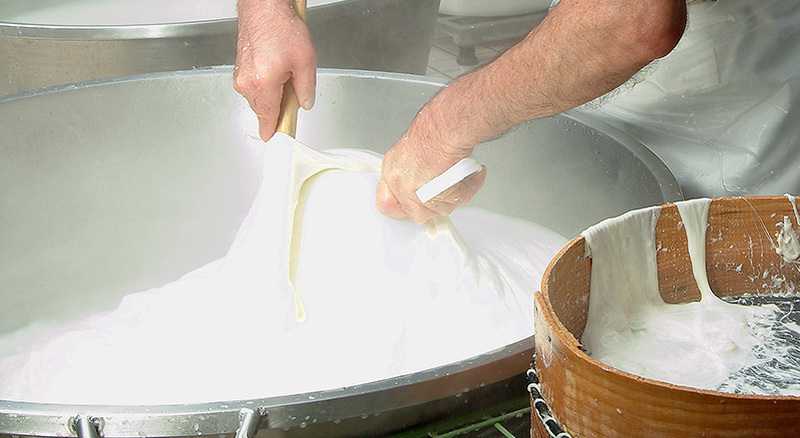 After having well mixed and melted it, curd is stretched with hands and a small wooden stick: if it stretches out without breaking, it is considered as “ready” for next step of spinning. Curd, as soon as it reaches a good maturation level, is put on inclined and drained tables, which ease evacuation of residual serum. Afterwards, it is cut into strips and put in specific tanks, which today are still made of wood and are called “mastelli”, and in which boiled water is added. Contact between boiled water and curd sparks melting of the mass. It is then continuously lifted and stretched, until a unique homogenous body is obtained, which will be formed in every desired shape. Mozzarella di Bufala Campana DOP produced this way is first put in cold water, which gives the product a first important hardening. This one will be completed in other containers filled with saline solutions, giving the product the right level of palatability. 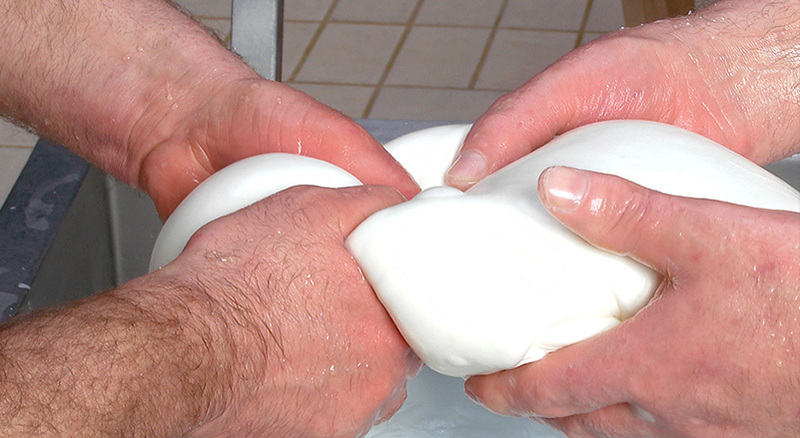 How to recognize Mozzarella di Bufala Campana DOP ? The following indications must appear on each wrap: – The whole name of the designation Mozzarella di Bufala Campana – Presence of the logo above the mentions of national (D.P.C.M.10/5/93) and european (Règ. CE n.1107/96) laws, in addition to the authorization number of the dairy (AUT. CONSORZIO TUTELA N. 000/00/0000). After phases of acidification, coagulation and spinning, the particularity of Burrata is its artisanal preparation which consists in forming a sort of pouch that we stuff with stracciatella. 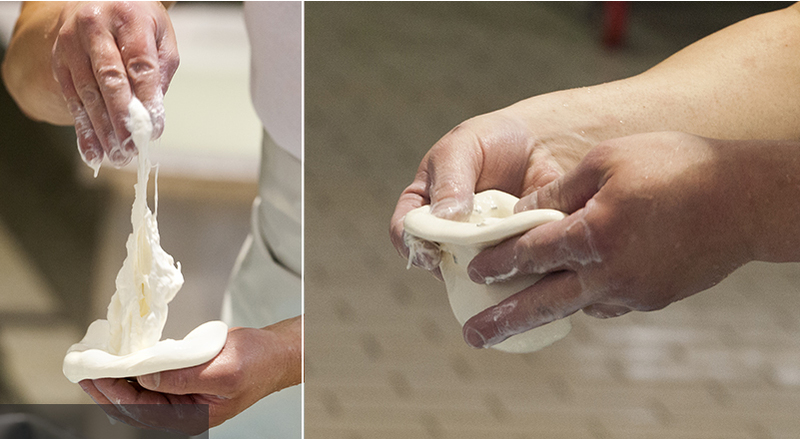 To say it differently, a part of the pasta filata is handly stretched and mixed with cream in order to obtain stracciatella ; this smooth filling is then enclosed in “pasta filata leaves” artisanally shaped. Today those bundles are sealed working on the mouth and immediately sealed in boiled water, but long ago they were linked thanks to leaves from a local wild plant, which also gave them a nice smell. A production, therefore, only artisanal which makes the pride of its native region.